NY Times Select: the experiment is officially done. In early August the NY Post ran a story citing “sources briefed on the matter” saying that rival NY paper, The Times would discontinue their paid subscription service Times Select. The rumor fell into the category of “more likely true than not” but for the last month it languished without update or official comment. Now it’s official. 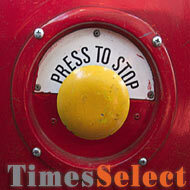 Times Select is done. Effective midnight Tuesday Times Select will cease being selective and revert to freely available, publicly accessible content. The Select service began two years ago as a value added service. They charged $49.95 a year (or $7.95 a month) for online access to the work of some columnists. The offer also gave access to the Times’ story archives from 1987 to the present. Over its life, Times Select was a moderate success. The offering drew about 227k paid subscribers and earned about $10m a year. Those positive numbers, however, don’t reflect what amounts to a greater loss: lost audience. For all those who paid, there was another group who, upon finding a Times article on a search engine and being confronted with a “pay to play” scenario, chose to walk away (costing the Times potential advertising revenue). The nature of how we find information is partly to blame. In this age of information-overload many people treat news like a commodity and search engines are our trading platform. Instead of taking a singular point of view of from one trusted source, the ubiquity of content has made it possible, even trained us, to look toward a vaster pool of resources. In music, we don’t listen to one radio station, we flip to find the song we want to hear. On television, we’ve moved away from being a culture that watches the nightly news on one channel. Instead, we flip the channels to hear the different headlines. It’s a time when consumer loyalties are harder to gain. We’re always looking for more, and online news is no different. In killing the Time Select effort, management at the Times is in some ways tacitly accepting these changes occurring in online media. It is a move that recognizes we’re entering in to a networked age, one where brand is important, but in the consumer’s value proposition: not at the expense of choice and access. It stems from one fact in particular: today it is impossible for a single media site or service to exist as a single, complete one stop resource. No company can cover all the news all the time. Things happen too fast. It’s the long tail in short time, an environment where great depth of information mixes with rapid change. Consumers are aware and always looking for more, they are bound to roam. That means, consequently, for big news media, the opportunity is strong in syndicating what they do best; high quality professional journalism. Sheer volume of news resources won’t ever drown out timely investigative reporting. And to distribute that level of quality content, opportunity is not in being an island but instead in being a part of a bigger network, something more like spider web with lots of different points for an audience to come into contact. Killing Times Select is a step in that direction.